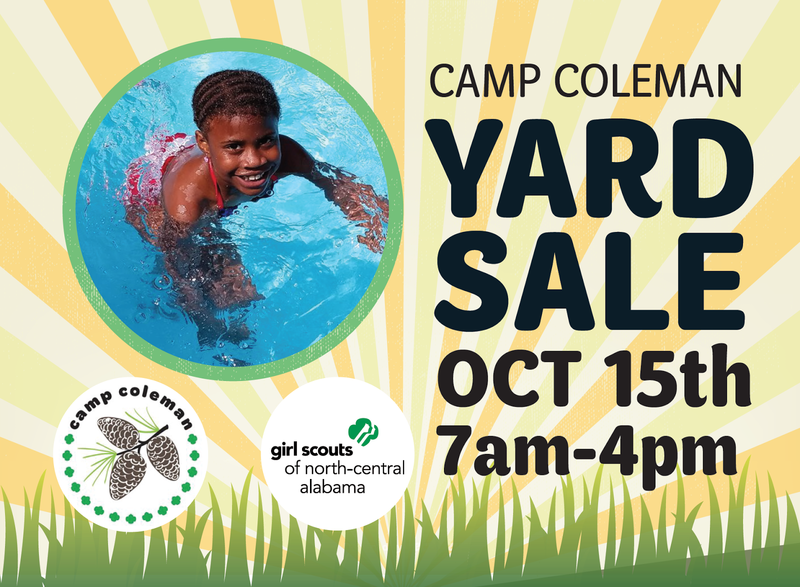 Girl Scouts of North-Central Alabama will host a yard sale on Saturday, October 15, from 7 a.m. to 4 p.m. at Camp Coleman in Trussville. The event will be the first in a series of fundraisers to revitalize each of the council camp pools. Items for sale will include camping supplies, furniture, electronics, sporting goods, toys, Girl Scout memorabilia, Girl Scout troop supplies and more. A pre-sale event will be held Friday at Camp Coleman from 6:30 p.m. to 9 p.m. For the $5 admission, attendees will be able to participate in a silent auction and have the opportunity to purchase before Saturday’s sale. The council’s fundraising goal for the sale is $5,000. It will take nearly $60,000 to revitalize the pool at Camp Coleman. Founded in 1925, Camp Gertrude Coleman sits on the banks of the Cahaba River in Trussville, Alabama and is the third oldest operating Girl Scout camp in the country. With the vital support of the community and Girl Scout volunteers, Camp Coleman provides water activities, horseback riding, ropes courses and much more. The camp is owned and operated by the Girl Scouts of North-Central Alabama and can be rented for troop camping, activities or private events. Camp Coleman is located at 4010 Camp Coleman Road in Trussville. Find out more and book a reservation at www.girlscoutsnca.org. We're over 13,000 strong—9,500 girls and 4,000 adults in 36 counties in the state of Alabama who believe girls can change the world. It began over 100 years ago with one woman, Girl Scouts' founder Juliette Gordon "Daisy" Low, who believed in the power of every girl. She organized the first Girl Scout troop on March 12, 1912, in Savannah, Georgia, and every year since, we've made her vision a reality, helping girls discover their strengths, passions, and talents. Today we continue the Girl Scout mission of building girls of courage, confidence, and character, who make the world a better place. Girl Scouts is the preeminent leadership development organization for girls. Girl Scouts of North-Central Alabama is a United Way partner. To volunteer, reconnect, donate, or join, visit www.girlscoutsnca.org or call 800-734-4541.